Abs Exotic Repair - ABS Exotic Repair can handle any job, ranging from oil changes and routine maintenance to complete engine and suspension overhauls. Address 700 North Andrews Ave. 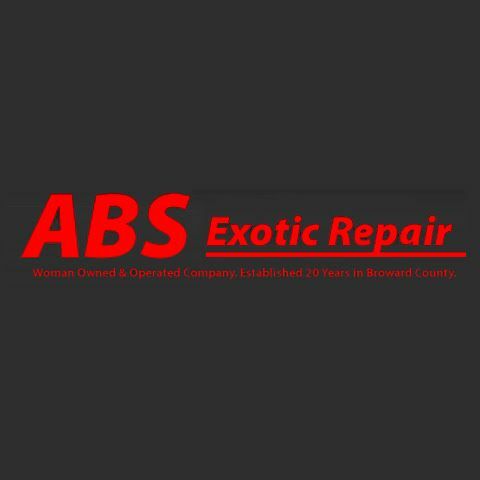 Welcome to ABS Exotic Repair! For over 20 years, Angela, “The Auto Repair Lady”, has been showing up the boys when it comes to making sure your vehicle not only runs smoothly, but heads back out on the road feeling sleek and stylish. Specializing in repairs, service & full restoration for Mercedes Benz, BMW, Jaguar, Porsche, Rolls Royce. Her shop has all the latest in diagnostic computers and scanning equipment to serve the needs of cars of yesterday & today. We strive to provide our customers with factory quality, fair pricing and excellent service. Angela’s shop has been featured in dozens of newspaper, magazine & TV feature stories. You can be sure that your car is in excellent hands. Call us today to book an appointment, if you’re in Fort Lauderdale, just stop on by & say hello. We look forward to meeting you and getting you back on the road. Author, Founded Automotive Education Program Series titled "The Car Clinic for Women"
Ft Lauderdale, Miami, Florida Keys, Broward, Monroe; We can also arrange for pick up/transport from anywhere in the US!